The attention of the District Educational Officers of Krishna and Guntur districts is invited to the reference 1st and 2nd cited above. 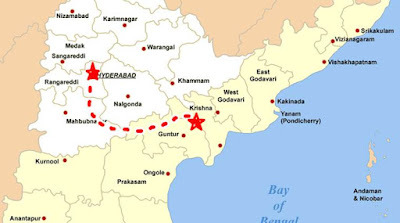 They are informed that the Government of Andhra Pradesh has decided to shift the Employees of Secretariat and I-leads of the Departments to the New Capital of A.P in the first phase of June, 2016. As such, it is inevitable for the employees and their families to shift to the New Capital region. 1. The District Educational Officers should issue instructions to all the Managements of Government Aided and Unaided Private Schools affiliated to CBSE, ICSE and SSC under their jurisdiction to provide admissions to the wards of employees of A.P. Government on production of Govt. ID cards alongwith other required documents TC, Marks card, Date of Birth Certificate, etc. 2. The District Educational Officers should ensure that admission should not be denied by any of the schools to the ward of the Government of A.P. employees on any ground. 3. Necessary exemption may be provided for creating Additional seats/Sections to such schools where Government of A.P. employees' children are to be admitted for the Academic Year 2016-17. 4. Sri. V.N.Mastanaiah, Joint Director (Services) will coordinate from O/o Commissioner of School Education, A.P. in this matter. 5. A Grievance Cell should be constituted in the DEO's office to redress the grievances relating to denial of admissions in Schools to the wards of employees of Government of A.P. 6. The details of the persons in the Grievance Cell like Name, Designation, Cell No., Landline Number and Email ID should be furnished to this office duly giving wide publicity through print and electronic media. Therefore, the District Educational Officers of Krishna and Guntur districts are requested to strictly adhere to the instructions issued and take' further necessary action to issue instructions to all concerned immediately. Treat this reference as Most Urgent.